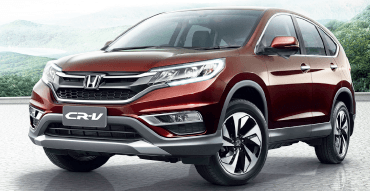 HONDA has unwrapped its freshened-up bestselling sports utility vehicle, the CR-V. Priced from RM139,800 for the just-introduced two-wheel-drive, 2-litre variant, it is joined by the 2.0L 4WD (RM150,800), and the 2.4L 4WD (RM169,800). Regarding the impact of GST upon car prices, Honda Malaysia’s managing director and chief executive officer Yoichiro Ueno said that a price reduction of up to 2% can be expected with the implementation of GST. Ueno says both engines are paired with the company’s five-speed automatic transmission. “This is used in place of the continuously variable transmission unit commissioned for use in these models overseas due to market suitability,” he said. Honda claims improvements in fuel consumption for both engines in this update; from 11.2km per litre to 11.78km per litre for the 2.4-litre variant, and from 11.7km per litre to 12.25km per litre for the 2-litre variant. New to the 2.0L 2WD and 4WD variants over the pre-facelift CR-V are high intensity discharge headlamps, LED daytime running lights, eight-way power-adjustable driver’s seat, smart key with push start button, self-dimming rear view mirror, Bluetooth hands-free telephony, leather seats and a touchscreen audio control surface. For the 2.4L 4WD, new for the facelift are LED daytime running lights, self-dimming rear view mirror, and Honda LaneWatch, a blindspot camera beneath the offside door mirror. This Honda CR-V may also be specified with a choice of two bodykits — either the Aero package (RM6,000) or the Elegant package (RM4,500). There are also two utility accessory packages, the Urban package (RM2,650) or the Utility package (RM3,000). The facelifted Honda CR-V is covered by a five-year, unlimited mileage warranty. This article first appeared in The Edge Financial Daily, on January 22, 2015.